(a) St. Ignace, MI is the northern anchor of the Mackinac Bridge and a gateway down into Lake Michigan or out into Lake Huron and the North Channel. It a place full of history and beauty. A French jesuit mission and fur trading fort from the mid 1600's, its museums (Ojibwe Culture and Fort de Baude) and historical interpretation of the Marquette Mission offer hours of pleasure for a visiting sailor. Click here to visit St Ignace, MI. (b) Menominee, MI and Marinette WI face each other across the Menominee River where it flows into the beautiful Green Bay. An important shipping port on the Great Lakes, these twin cities offer a cruising sailor lots to experience in this corner of lake Michigan. Click here to visit Menominee MI and Marinette WI. positive and for that I am grateful. The sale proceeds go to help defray the costs of running this 250+page website. This Log Book was created to help you by providing a practical tool you can use immediately. I think it is as equally valuable to an experienced sailor as it is to someone who is just beginning to set out exploring the Great Lakes. It is a comprehensive record book with documents, forms, planning sheets, resources and information that can be used immediately. Immediate delivery as a simple pdf download. 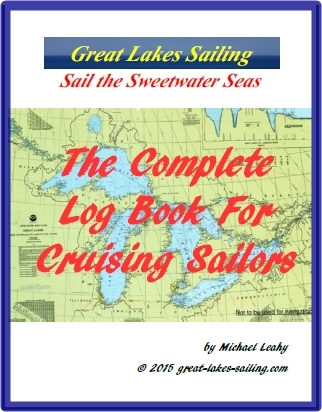 Order your Log Book today and download the pdf e-book immediately. Payment is done securely through Paypal You do not have to have a Paypal account to purchase the e-book. Your payment information is never shared with Great Lakes Sailing. For more information or to order, click here. If you have suggestions or recommendations for additional material to be added to this e-book or want to submit a review, please feel free to contact via the website. Once you purchase the e-book, all future updates to the Log Book will be free for you. I will be speaking again this year at the The Toronto Boat Show. the largest indoor boat show in North America. This year it will run from Saturday, Jan 9th till Sunday, Jan 17th with a special 'preview' day on Friday, Jan 8th. The show is located at the Enercare Centre at the Toronto CNE grounds. I will be speaking there again this year. Here is a link to the show's website. Here is my speaking schedule. If you are in the area at those times, drop by and say 'hello'. I'd love to chat with you. The town of Port Clinton, OH has received a grant to begin the plan for a new Waterworks Park. The proposed plan includes boardwalks along the waterfront and additional docking facilities for transient sailors – something that is always of interest to us. Port Clinton has long been a magnet for cruising sailors in part because of its close proximity to the Bass Islands. To learn a little more about this area, visit Port Clinton here. Its hard to believe that it was just 2 years ago that people were very worried about the record low water levels on Lake Huron. In fact, they were the lowest on about a century. What a difference 2 years can make. Today, the water level is at a record high and creating a host of new problems. From docks left high and dry, people and communities are now dealing with submerged docks and piers, erosion and more. Some have suggested that what is occurring in Lake Huron could serve as a proxy for the entire Great Lakes. 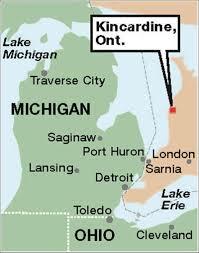 Huron County lies in Ontario, along the Lake Huron coast and includes the lovely harbour of Goderich, ON. The University of Michigan and the Rural Ontario Institute (a not-for-profit foundation) are currently examining funding a detailed study of the impacts of this change, including impacts of boating and marinas along the lakes. From Napoleon on Lake Ontario (see here) to pirates like Dan Seavey on Lake Michigan (see here), there is no end of unique and strange stories about our fabulous inland seas. In that vein, let me introduce you to a crowned king who lived on Lake Michigan – James Jesse Strang. Strang, a Wisconsin lawyer, was a Mormon in the early days following the establishment of that religion. Strang was a charismatic leader and when Joseph Smith, the founder of the Mormon religion was murdered, Strang led his followers in 1847, to Beaver Island in Lake Michigan. Beaver Island is a large island that lies in the middle of the lake at its northern end. Over the next decade, they built a solid, thriving community numbering some 2,600 that prospered from selling fish and timber to the many passing trading ships that plied the Great Lakes. Records of the day also report that he led a pirate crew that preyed on small defenseless villages on the coastlines. Along the way, in 1850, he was crowned king of Beaver Island. Needless-to-say, this did not go over well with the US government and a USN warship was dispatched to arrest him for treason. He was duly arrested and transported to Detroit for trial. A powerful speaker, Strang was acquitted and returned to rule Beaver Island. As King, he also sat for two terms in the Michigan state legislature. He was very authoritarian and more than one man was flogged for various transgressions. In 1856, a US naval ship docked at Beaver Island. Invited to dine with the Captain, Strang was shot in the back as he walked to the ship. Although it was watched, no-one said a word to warn him. The ship departed shortly thereafter carrying the murderers and their families to parts unknown. No charges were ever laid. Upon his death, hundreds of Mormons left for Wisconsin. Some 2,000 who remained were set upon by mobs from the mainland, burnt out and forced to flee for their lives. The kingdom died with Strang. Some months ago, I wrote about Ontario's public hydro utility Ontario Power Generation (OPG)'s plan to bury 7 million cubic feet of nuclear waste right beside lake Ontario near the village of Kincardine ON. While plans to do so continue to move slowly ahead, federal legislators from Michigan – Senators and Representatives, have sent a letter to the new Canadian Prime Minister Justin Trudeau asking his government to block this proposed plan. Other American legislatures are urging the US government to invoke the 1909 Boundary Waters Treaty which would require a bi-national review of this scheme. Part of the concern stems from the fact that the expert review panel was composed primarily of nuclear industry representatives and the perception of bias. Our Great Lakes are an irreplaceable treasure. If this plan is sound, there is no need for haste in shoving it through.This is especially the case when one reads the Ontario Audior General's scathing report on the the incompetence and mismanagement of OPG. If this is such a good idea (as if burying nuclear waste right beside the drinking water of 40,000,000 people could ever be considered a good idea), it would survive another review. Mail can be sent postage free. Or send an email. – their name and email address can be found under each members profile here. Write to your Ontario Member of Provincial Parliament. Contact information is here. If you are an American citizen, write to you congressional representatives in the US Senate and the House of Representatives. The contact information for members of the House of Representatives can be found here. Write to your state representatives as well. Lest you think these sorts of ideas are unique or one-offs, there is currently a dispute in Wisconsin about the City of Waukesha's goal to divert millions of gallons of water daily out of Lake Michigan and in fact right out of the Great Lakes basin. Next stop is California I guess. 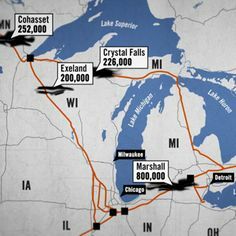 Or consider Enbridge Oil's Line 5 that carries 23 MILLION gallons of crude oil daily under the Straits of Mackinac in a 62 year old pipeline that has already ruptured several times including the 800,00 gallon disaster at Kalamazoo, MI. It could never be built today but experts have said it is an enormous risk to the Great Lakes. So, does your email or letter matter? You bet it does.